Makeup Geek.com Eyeshadow Makeup Review of shades Brown SSugar,Galaxy, Ocean Breeze, Chickadee, Yellow Brick Road, Gold Digger, Mandarine, Razzleberry, Cinderella, Cupcake, Mango Tango, Burlesque. I have been waiting to review these puppies as soon as I got contacted by the MUG Team. The eyeshadows are created by Marlena the creator and CEO of makeupgeek.com. 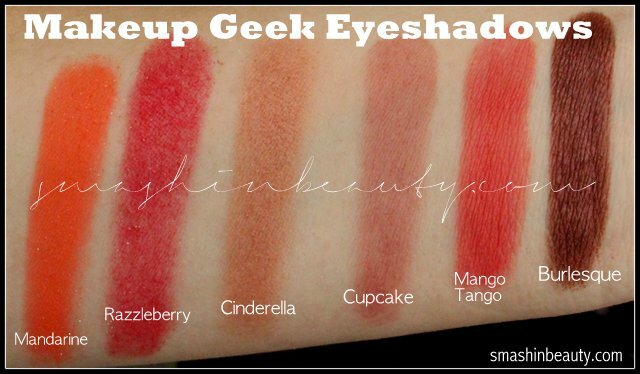 I have to say that before I got my Makeup Geek (a.k.a MUG) Eye Shadows I heard many good things about these beauty product review shadows. So let’s have a look at them. Comparing them to the eyeshadows that I currently have and use. I must admit this is gonna be a gonna be a really good beauty product review. This makeup review of the Makeup Geek eyeshadows, tells you that the eyeshadows that tend to crumble. Not all of the eyeshadow crumbled or better said had fall outs but some of the darker shades has a bit more sensitivity on touch then the other ones. I can compare this makeup review with the wet n wild palettes 8 Icon eyeshadow palettes. The shadow with the most fall outs was my favorite eyeshadow burlesque. Razzledazzle was a bit disappointing. The shadow was “cracking” when applying. I believe it might have been due to the glitter. This completes the makeup geek eye shadow makeup review cons. The pros of the Makeup Geek eye shadow makeup review is that the shadows are so pigmented that one cannot believe that without a primer you get this much color. All I can say is good bye to a few brands because these shadows are decent priced and you get loads of the shadow since they are really well pigmented. The MUG shadows glide on with ease and are easily blending with each other. The Makeup Geek eye shadow makeup review do not stain skin. The price of each of the pots is $5,99 and not they are available in pans and compact pans. I prefer the pans which are magnetic, so that I can place them in my DIY magnetized freestyle eyeshadow and/or makeup palette. I love making my own palettes. The texture is soft and high quality. Their is no smell so this is the pros expect in the future Makeup geek coupon code 2013. Volim tvoje tuturiale jer imam isto tamno smedje oci i slicne smo puti. Evo, narucila sam par MUG sjenila (Moccha, Shimma Shimma i Purely Naked), cisto za probu. Ako stignes, bilo bi lijepo da napravis jos koju kombinaciju s MUG sjenilima.